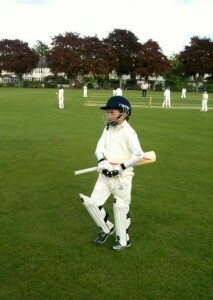 The boy made his debut in competitive cricket last night, ostensibly playing for Barnes Cricket Club’s U10s. However as the opposition – Hampton Wick Royal – only had 7 players so we lent them 3, one of which was Miles. They asked him if he wanted to open the batting, but he declined and went in at number 6. He scored a run off his first ball and could’ve had three more runs but wasn’t sure when to run and when to stay – I’d forgotten to drill him on that! He then got another wicket in his second and final over, leaving him with some pretty good statistics for his first competitive game of cricket.Pretty good considering all the boys were at least a year older than him and some were as old as 11. We got back home just in time for bed, reminding me that despite his auspicious debut, he is still just a little boy.